Most people who call have never had their air ducts cleaned before and are unfamiliar with how it all works. I would like to take this time to explain how the truly painfree experience you will have with my company… but first a warning. BEWARE of Scams, Cheap Prices, & Cheap Equipment! These coupons are examples of deceptive advertising and can be found in your own local coupon books. They show a cheap price, but when the fine print is read, that cheap price only cleans a small amount of ductwork, and then the scams begin. During your phone conversation with one of these con artists, you’ll never get an exact price for all of your duct work. They will only give you an estimate until they arrive at your home with what amounts to a shop-vac in the back of their van. Then the price suddenly changes from the cheap estimate to over double what a legitimate duct cleaning company would charge. We recently had a widowed senior call us in tears that she had just written a check for over $1500 for an inadequate cleaning that should have cost only $349. One way to identify a scam artist is by the quality of their equipment. 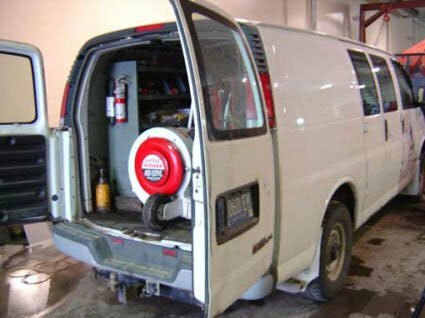 Small van vacuum equipment systems, like those seen in the picture on this page, are only capable of moving 4000 cubic feet of air per minute, versus our Power Vac trucks that move an astonishing 16,000 cubic feet of air per minute. "We are always to happy to answer any questions you may have when booking your appointment and provide you with a free, honest, and accurate estimate for cleaning your entire home’s air ducts. When you choose us you can expect superior service that starts with two certified, uniformed technicians arriving at your home with a giant powervac truck. After a brief consultation we will begin the process. Then, all corners leading from your garage to your basement will be tarped and a large 10″ vacuum hose will be brought to your furnace and connected. When the truck is engaged and the twelve large airbags pop out the top, your whole house will be placed under negative pressure. This means you will actually be able to hear and feel a tremendous vacuum coming from each of your vents. While this is taking place, we will go to each of your registers with pushrods and compressed air (300psi) and actually push the debris down your lines and into the trunks where it will be cleaned and sucked out to the truck. Most people enjoy coming down into the basement when we’re cleaning their main trunks and are amazed at how much debris the giant vacuum hose pulls from their home. The process is now complete. You can enjoy the benefits of clean air in your home." See Our Air Duct Cleaning Process In Action! We are committed to giving our clients a safe, natural alternative to a clean indoor environment while giving them their freedom to breath easier. Contact us today to get a free, accurate, and honest estimate for your air duct cleaning.